A leakage in a fuel pipeline from the tankers to the Muthurajawela Oil Refinery Complex was reported in the Uswetakeiyawa area on Friday night. A Ceylon Petroleum Corporation team (CPC) on patrol visit observed the leakage on Saturday morning and immediate steps were taken to bring the situation under control, Petroleum Ministry Secretary Upali Marasinghe said. 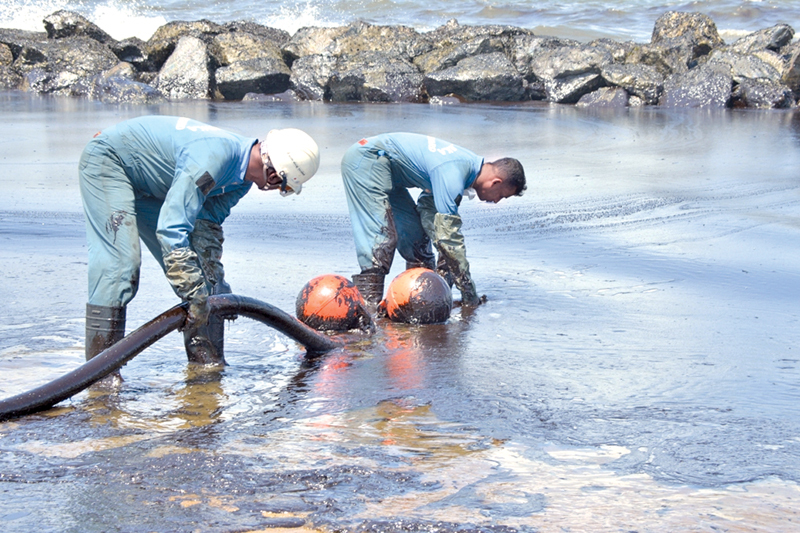 “Due to the leakage, an oil spill was identified in the beach area from Dikovita to Uswetakeiyawa, while efforts to clean the sea area by removing the fuel spill are being carried out with the support of Sri Lanka Navy, Ceylon Petroleum Storage Terminals Ltd., Marine Environment Protection Agency and the Coast Conservation Department,” he said. Over 300 naval personnel attached to the Western Naval Command and Coast Guard joined the cleaning up operation with the support of Sri Lanka Coast Guard ships ‘Samaraksha’ and ‘Samudra Raksha’, which were presented to the SLCG by the Japanese Government on August 29. According to the Secretary, the CPC has incurred a loss due to the leakage. He said an assessment in this regard will be carried out. According to Marasinghe,a new pipeline is being laid replacing an old one and 90 per cent of the construction work has been finished. The rest of the construction work is expected to completed by year’s end, but a group of illegal dwellers in the Mahawatte area, beside the railway track from the Colombo harbour to Kolonnawa are protesting against the project. “Currently, we are in discussions with them to settle the problem,” Marasinghe further added.